This week we’ll study a nightmare that is archetypical; it contains a theme that is common to many dreams and is experienced, on occasion, by the vast majority of dreamers. Although the specifics of the plot may vary from dreamer to dreamer, most of us will recognize the substance and the alarming nature of the circumstances being described. In this case, the dreamer—a woman in her 40s—has had variations of this dream for many years. In my dream, there is never a beginning. The dream always seems to start in the middle of the action, as if I had arrived late at a movie that was already showing. 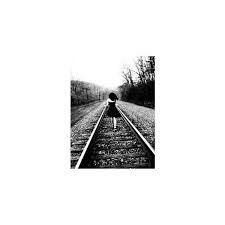 In my dream I suddenly become aware that I am struggling to walk along railroad tracks. I somehow have to keep jumping from railroad tie to railroad tie, because they are spaced too far apart for me to just step from one to the other. To make matters worse, it’s as if my whole body were immersed in molasses, because I can’t seem to get any of my limbs to move quickly. It’s terrifying because I know that there is a train right behind me, and if I don’t hurry up, it’s going to run me over and kill me. I can hear it approaching. Its whistle is warning me to move, and the noise is deafening. Just as I am about to be hit, I wake up. When I have this dream, I always wake up in a sweat, and my heart is always pounding. What’s really bizarre is that I never seem to think to jump sideways off the tracks. I always remember that that’s an option after I’m awake. I’ve had this dream since I was a girl. Sometimes the tracks or other elements of the scene change. Sometimes there are slight differences in the story or the circumstances. But otherwise, every time I have the dream, it’s the same. And it is always scary. Dreams can be about anything. You can have prophetic dreams, encounters with deceased relatives, relive past lives, be travelling out of body or, in the case of recurring dreams, be dealing with a long-standing conflict. But one thing dreams are always about: they are always about a current issue that the dreamer is grappling with. I have never known of an exception to that. Even if you, as a dreamer, predict a tsunami and it comes to pass, you are having that dream also because there is some sort of personal, metaphoric tsunami that you are experiencing in your own life. When I work with dreamers, with rare exceptions, I begin with the now: What is going on in the dreamer’s life at this moment in time that has caused a nightmare to reoccur? Often, when that question is answered, the rest of the issues fall into place. It’s the question we’ll ask this dreamer as well as we work through her dream metaphors and symbols.